We made our first appearance on one of Chicago’s major local news networks! 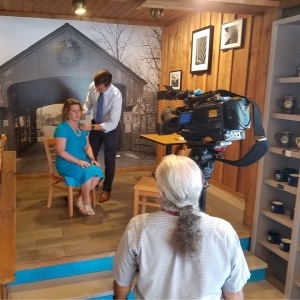 On Tuesday, August 21st 2018, we had the privilege of hosting ABC7 Chicago’s interview with Long Grove Historical Society’s President, Angie Underwood, about the damage to the Long Grove Covered Bridge. Fittingly, news reporter Mark Rivera was able to interview Angie with our Long Grove Covered Bridge mural as the backdrop. The interview came as a complete surprise to us, but of course we were more than excited to host it! Our co-founder, Eric Wallor, was also asked to do a quick interview and share his thoughts about what the Covered Bridge means to our business and the local community. Go Eric! 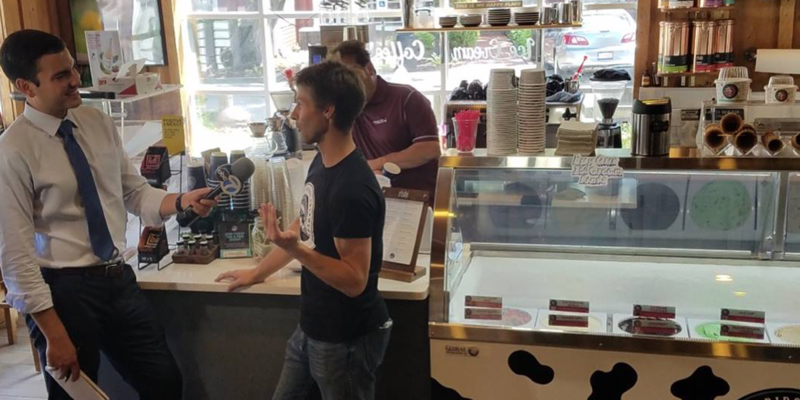 We’re thankful for ABC7 News for providing some great coverage for our ice cream, coffee, and tea shop. And of course, we can’t wait til our beautiful town’s beloved bridge is brought back to its historic glory! Catch a glimpse of the entire news segment that aired on ABC7 on August 24th in this video. Here’s a link to the original story that appeared on ABC7 Chicago. © Copyright 2018 Covered Bridge Creamery, Inc.